Recombinant monoclonal antibody to CD8 alpha. Manufactured using AbAb’s Recombinant Platform with variable regions (i.e. specificity) from the hybridoma YTS 105.18. Immunogen: Ly-2-transfected mouse L cells. Specificity: Recognizes a non polymorphic epitope on the mouse CD8 alpha chain. This antibody has been reported to block MHC I dependent T cell responses in vitro and in vivo. 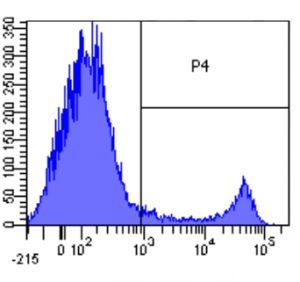 Application Notes: This antibody can be used to stain for murine CD8 and can be used to block interaction with CD8. Note on publication: Describes the generation of this antibodies and its characterization, including its funtion in suppressing skin graft rejection. Flow-cytometry on mouse lymphocytes using Ab00171. 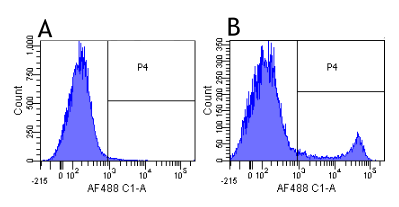 Flow-cytometry using anti-CD8a antibody YTS 105.18 (Ab00171) Mouse lymphocytes were stained with an isotype control (Ab00102-23.0, panel A) or the rabbit-chimeric version of YTS 105.18 (Ab00171-23.0, panel B) at a concentration of 1 µg/ml for 30 mins at RT. After washing, bound antibody was detected using a AF488 conjugated donkey anti-rabbit antibody (ab150073) and cells analysed on a FACSCanto flow-cytometer.